A barrier to public participation in redistricting is access to data needed to draw legal districts. These data include geographical, population, and election data. The Census Bureau collects individuals' characteristics through the decennial census as required by Article 1, Section 2 of the U.S. Constitution and through other large-scale surveys such as the American Community Survey and the Current Population Survey. The Census Bureau protects individuals' confidentiality by tallying their responses within areas that are known as census geography. The smallest unit of census geography is known as the census block. These census blocks are literally the building blocks for districts. A census block is analogous to a city block in an urban area. In rural areas, blocks also follow roads, but more often follow natural features such as rivers and lakes, which they also do in urban areas. Collections of blocks are known as block groups; collections of block groups and known as tracts, and tracts are nested within counties. As this implies, states work with the Census Bureau to identify their political boundaries -- their counties, cities, townships, legislative districts, and almost all also identify their precinct boundaries. Census blocks also follow these political boundaries. There are numerous other geographies that make up the census geography. Most census blocks are not squares. This should be obvious since rivers to not follow straight lines. Indeed, city boundaries in particular can be oddly shaped, resulting from annexation battles among county residents as cities encroach on their land. Some people prefer city services and some do not, so these battles often have a distinct ideological flavor and can be meaningful from a representation perspective. A map of Springfield, Illinois illustrates these complexities. 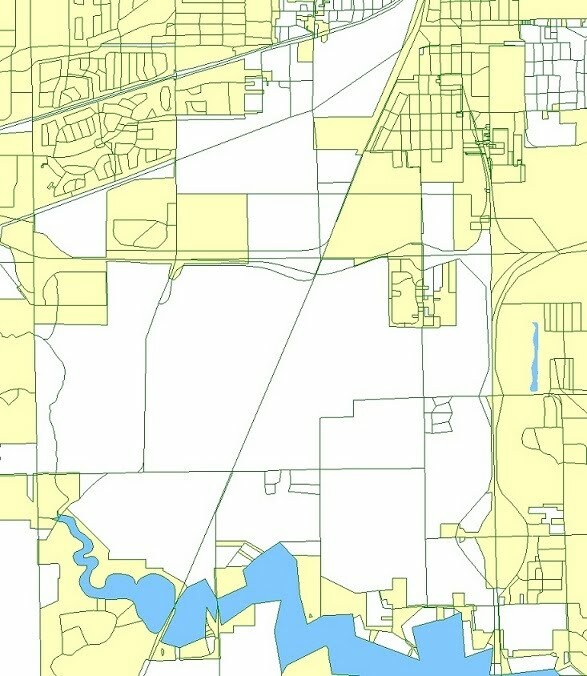 The census blocks are in green city's boundaries are in yellow. The census blocks generally follow roads, but are not regularly shaped since the roads themselves are not laid out on a regular grid. Lake Springfield is the blue extension at the bottom of the image, and it is not regularly shaped, either. Throughout, pockets of Sangamon County are interspersed within the city of Springfield. Some advocate drawing districts to be squares or other compact shapes to combat gerrymandering. It should be obvious that the census geography is not amenable to drawing compact shapes since the lines are not nicely arrayed for such purposes. It is possible to split census blocks, but because districts must be of equal population, a supplementary census would need to be taken in the split blocks to confirm that district populations are equal -- an expensive and time-consuming task. This approach would also ignore the political character of communities, and the reasons why they do not have nice compact shapes. A further issue is that compact districts have predictable political effects, in that they often pack Democrats into urban districts, which is often a Republican gerrymandering strategy. The entity responsible for disseminating population data for redistricting is known as the Census Redistricting Data Office. The office releases counts of the population within census geography for redistricting purposes in what is known as the PL94-171 file -- so named after the public law that authorizes the data release. The Census Bureau asks only a limited number of questions on the decennial census short form, and only some of these data are released in the PL94-171 file. Total population counts are used to determine compliance with the federal requirement that each district has an equal number of persons. The voting-age race and ethnicity categories are used to determine compliance with the federal Voting Rights Act. There are two ethnicity categories. Race and ethnicity are separate questions. A person can choose to identify as a White Non-Hispanic, a White Hispanic, and so on. The Census Bureau reports counts for all permutations of the six racial categories, by ethnicity, in separate fields in the PL94-171 database. The Office of Management and Budget provides guidance on how to count people within these racial categories (see also this Department of Justice Federal Register Notice 66 Fed. Reg. 5412). For Voting Rights purposes, the African-American population is considered to be the sum of all the categories where individuals identify themselves as African-American in one or more combination with other races. Chapter 6 of the Census Bureau documentation lists all of these variables (Note the naming convention in the PL94-171 file is slightly different than in the documentation, the documentation has an extra "0"). For some states, we construct and disseminate our own redistricting databases that we use with the Public Mapping Project (listed below). The variables we use to construct total population and voting-age population are as follows. In the past, the Census Bureau conducted as part of the decennial census the long form, a survey given to 1 in 100 households. The long form had many other questions, such as income, education, and citizenship. This decade, the census long form has been replaced by the American Community Survey (ACS). The ACS is a monthly survey of thousands of households with similar questions as the old long form. This will be the first redistricting where these questions will be available during redistricting. Previously, the census long form data was released well after redistricting completed in many states. The Census Bureau is releasing results from the ACS in yearly, 3-year, and 5-year increments. The 5-year increments have the largest number of respondents. Remember that the Census Bureau does not release individuals' information, they report summary statistics to protect individuals' confidentiality. The 5-year ACS thus has the lowest level of geographical reporting, at the census block group or tract level. The ACS data are important for redistricting because they may be used to provide evidence to define a community of interest, where this is a state redistricting criterion. They may also be used to generate citizen voting-age population estimates by race and ethnicity, which may be used to determine compliance with the Voting Rights Act. The Department of Justice requested a special tabulation of citizen voting-age population data by race and ethnicity, and it is posted on the Census Redistricting Office's website. There are a number of issues with the ACS data that limit its accuracy. The ACS is an aggregation of five years of monthly ACS surveys. The mid-point for the most recent 5-year ACS release for surveys conducted from 2005 to 2009 is July 1, 2007. The ACS is weighted to the 2000 census. The ACS is a survey, not an enumeration, with a large margin of error for small geographic units. The ACS is reported in 2000 census geography. A correspondence between 2000 and 2010 geography must be created to report ACS data in 2010 geography. The ACS must be disaggregated to census blocks so that it may be used for redistricting, using one of the methods described in the Election Data section. Some states make available election data merged with census data, which enables one to assess the potential political consequences of proposed redistricting plans. Election results are reported in precincts, wards, or election districts, or what the Census Bureau generically calls Voting-Tabulation Districts or VTDs. A correspondence between census geography and VTD boundaries is needed to merge election data with census data. The creation of a correspondence between VTDs and blocks can be accomplished by three general methods, described below. Note that all disaggregation methods will almost always create fractions of people assigned to census blocks, for example a census block with 52.19 votes for Obama and 112.56 votes for McCain. This is an unavoidable consequence of apportioning people from the larger VTDs to the smaller census blocks. In this example, 52.19 represents a raw count of votes, not a percentage vote for Obama of 52.19%. If you do not understand why this is so after reading this section, you should not use these data. Method 1. Geo-spatial Join. Some states make available electronic maps of their VTDs. These electronic maps can be overlaid on electronic maps of census blocks, and a correspondence between VTDs and blocks can be created. A difficulty with this method is that the precinct and census block boundaries often do not neatly correspond to one another. When this happens, a method of assigning a census block to a precinct must be devised, such as assigning the block to the precinct that it shares the largest area or the precinct that it shares the longest street segments. Method 2. Geo-coding Voter Registration. Another method of creating a correspondence between VTDs and census blocks is to geo-code voter registration addresses. Registered voters are assigned to VTDs so that election administrators know which polling places registered voters should vote at. Geo-coding is a technique whereby address are assigned to census blocks using street ranges that the Census Bureau associates with each census block. These data are the same from which evolved the ability of popular on-line mapping programs to place an address pin drop on a street map. By geo-coding, each registered voters address -- and their VTD -- can be associated with a census block. A difficulty with this method is that voter registration addresses are notoriously error-prone, they can have incorrect zip codes or street addresses. Sometimes newly built streets are not in the Census Bureau's records. Splits of geography can still occur. 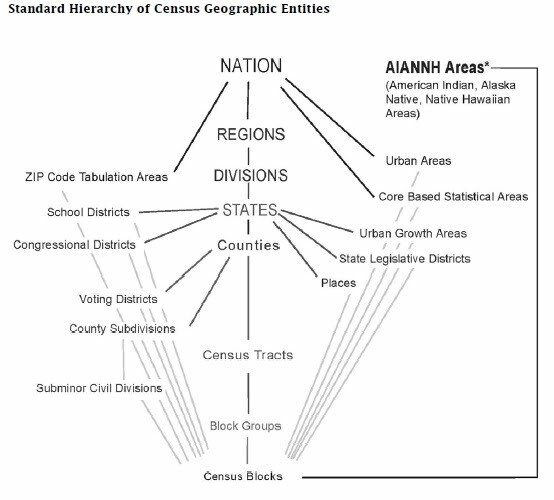 When a census block has more than one VTD associated with it, the VTD with the greatest proportion of registered voters located in the census block can be the one uniquely associated with the block. Method 3. Using Census Geography VTD Identifiers. States transmit their VTD boundaries to the Census Bureau and these boundaries are incorporated into the census geography. Election results reported in precincts, wards, and election districts can then be associated with the VTDs in the census geography. A difficulty with this method is that precincts, wards, and election district boundaries can change. When they become too large, they may be split into two new VTDs and when they become smaller -- or there is a low turnout election, such as a local election -- two or more VTDs may be consolidated into one VTD. The VTD boundaries are transmitted to the Census Bureau as part of the "Phase 2" program, two years before the census -- in 2008. Even by the time of the 2008 general election, splits and consolidations may occur. These changes can often be resolved by calling local election administrators. Still, these VTD boundary changes can proliferate in fast growing areas. Sometimes a change in polling locations forces a redistricting of the VTD boundaries, making a correspondence using Method 3 impossible. For this reason, the 2008 election is often the easiest election to correspond precincts, wards and election districts to the VTDs found in the census geography. Some states and local jurisdictions report their mail, provisional and other special ballots within a voter's home precinct. Some report the election returns for these ballots in special at-large precincts for the entire jurisdiction. When this happens, it is desirable to apportion these ballots among the geographic precincts. The most common method of apportioning election results from mail, provisional, and other special ballots reported in jurisdiction-wide precincts into geographic precincts is to apportion the votes by the proportion of the candidate vote within each precinct. For example, suppose a Republican candidate received 100 votes in two geographic precincts, 60 in precinct 1 and 40 in precinct 2. There is one at-large absentee precinct with 20 absentee votes, 10 for the Republican candidate. These absentee votes are then apportioned as follows: Precinct 1 receives 10*60/100 or 6 votes for a total of 66 votes for the Republican candidate and Precinct 2 receives 10*40/100 or 4 votes for a total of 44 vote for the Republican candidate. VTDs are larger than census blocks, so multiple blocks are assigned to each VTD. Census blocks are what districts are built from, so election results must be disaggregated to census blocks for use in redistricting. There are multiple ways to do this, consistent with the three methods described above. Method 1. Apportion election results to census blocks based on the proportion of a census block's area or length of street segments relative to the VTD. Method 2. Apportion election results to census blocks based on the proportion of a census block's registered voters relative to the VTD. Method 3. Apportion election results to census blocks based on the proportion of a census block's voting-age population relative to the VTD. In most instances Method 2 is the most accurate, Method 3 is the next most accurate, and Method 1 is the least accurate method of disaggregation. Method 2 is labor intensive and requires access to well-maintained voter registration files. Method 3 requires only census data and elbow grease. Redistricting databases created for the Public Mapping Project use Method 3. States may expend more resources to execute other methods. For consistency, our preference is to use state's redistricting databases where they are made public. Some states publicly release redistricting databases augmented with election data, some do not. We provide links here to states that make redistricting databases publicly available in some format. We expect more states will be added to this page as redistricting progresses. For some states that do not provide public databases, we will create our own databases to be used with our District Builder software. We do not provide user support for these databases. To use these databases, you should have large-scale database management skills and be familiar with census and election data. Arizona This block level database is in comma delimited format. It may be accessed here. The unique census block identifier is GEOID10, and is consistent with census naming conventions. The database includes total population and voting-age population by race and ethnicity variables, as described above. Precinct level results are obtained from the Arizona Secretary of State. Note that the sum of the candidate vote totals is slightly different than the statewide candidate totals reported on the Secretary of State's website. This is due primarily to a small number of votes assigned to the Pima County Courthouse, which has zero population according to the Census Bureau. Create a correspondence between Arizona's 2010 VTDs and the 2008 and 2010 precincts. By law, Arizona freezes its precinct boundaries in the two elections preceding a redistricting. Precinct splits -- where there is no one-to-one correspondence between the VTDs and precincts -- in Graham and Navajo Counties have been verified with local election administrators and the election data properly aggregated into the VTDs. In Maricopa County, we determined that the incorrect VTDs were transmitted to the Census Bureau. Maricopa County election officials provided us with an updated block level assignment file for their precincts. The field "PRECNAME" is the VTD name for areas outside of Maricopa County and the precinct name within Maricopa County provided to us by local election officials. Precinct level votes for each candidate are then apportioned among census blocks according to the share of voting-age population of the block within each precinct. For example, suppose in Precinct 1 the Democratic candidate has 100 votes, the voting-age population is 100 persons, and there are two census blocks with voting-age populations of 60 in census block 1 and 40 in census block 2. Census block 1 would be apportioned 100*60/100 or 60 votes for the Democratic candidate and census block 2 would be apportioned 100*40/100 or 40 votes. As one can imagine, in practice, these election data are not disaggregated to census blocks in whole numbers. To ensure that the statewide totals are preserved, candidates' votes are reported with fractions in double precision format. Election data for eight statewide races are provided in the following fields. Florida This block level database is in comma delimited format. It may be accessed here. 2006 and 2010 election data are provided by Florida Redistricting, the Florida House redistricting web site. The data reside on the Open Data portion of the web site. We have converted these data into a flat file data structure for use with our software. The Florida House redistricting staff have disaggregated election data to census blocks by the proportion of the area of a census block that is contained within a precinct. This method is unlike many other databases available here, where data are disaggregated by the proportion of the voting-age population. While we could modify these data to apportion the election data by voting-age population, we have chosen not to in order to keep the data in a format that is consistent with what the Florida House is using. Election data for selected statewide races are provided in the following fields. Georgia This block level database is in comma delimited format. It may be accessed here. Precinct level results are obtained from Stephen Ansolabehere, Jonathan Rodden. Georgia 2010 Census Shapefile and Precinct-Level Election Data. Release 2011. Note that Georgia reports mail-in absentee and in-person early votes in separate jurisdiction-wide precincts. These election results are not apportioned to the geographic precincts. As a result, the sum of the block level election results does not equal the statewide election results reported on by the Georgia Secretary of State. Election data for four statewide races are provided in the following fields. Illinois This block level database is in comma delimited format. It may be accessed here. Precinct level results are obtained from Stephen Ansolabehere, Jonathan Rodden. Illinois 2010 Census Shapefile and Precinct-Level Election Data. Release 2011. Only 2008 presidential data are available, as these data were hand entered from hard copies of precinct level election returns. This block level database is in comma delimited format. It may be accessed here. The database includes total population and voting-age population by race and ethnicity variables, as described above. In addition, a variable VAP_NH_DOJ_BLK is the Department of Justice definition of Black that includes non-Hispanic persons who identify as single-race Black or bi-racial Black and White. Precinct level election results are obtained from the Marion County, Indiana Board of Elections. Precinct level election data are apportioned among census blocks according to the share of voting-age population of the block within each precinct. For example, suppose in Precinct 1 100 people voted for the Democratic candidate, the voting-age population is 100 persons, and there are two census blocks with voting-age populations of 60 in census block 1 and 40 in census block 2. Census block 1 would be apportioned 100*60/100 or 60 votes for the Democratic candidate and census block 2 would be apportioned 100*40/100 or 40 votes for the Democratic candidate. As one can imagine, in practice, these registration data are not disaggregated to census blocks in whole numbers. To ensure that the statewide totals are preserved, registration totals are reported at the census block level with fractions in double precision format. Election data are provided in the following fields. Massachusetts This block level database is in comma delimited format. It may be accessed here. Precincts voter registration data are obtained from Stephen Ansolabehere, Jonathan Rodden. Massachusetts 2010 Census Shapefile and Precinct-Level Election Data. Release 2011. Only partisan voter registration data are available -- no election results are available. Precinct level voter registration data for each party are apportioned among census blocks according to the share of voting-age population of the block within each precinct. For example, suppose in Precinct 1 100 people were registered with the Democratic Party, the voting-age population is 100 persons, and there are two census blocks with voting-age populations of 60 in census block 1 and 40 in census block 2. Census block 1 would be apportioned 100*60/100 or 60 registered Democrats and census block 2 would be apportioned 100*40/100 or 40 registered Democrats. Partisan registration data are provided in the following fields. Michigan This block level database is in comma delimited format. It may be accessed here. Precinct level results are preliminary (pre-release) data obtained from Stephen Ansolabehere, Jonathan Rodden. Michigan 2010 Census Shapefile and Precinct-Level Election Data. Release 2011. We have performed extensive modification of these data to assign more precinct election results to census VTDs, to correct errors where we identified precincts were assigned to the wrong VTD, to apportion Absentee Vote Counting Board results among the geographic precincts, and to better account for precinct splits and consolidations. Also note that we determined that the data were assigned incorrect VTD ids, so we used the precinct and VTD names to perform our match and reassigned the correct VTD ids in our database. Despite this extensive rebuilding of this database, the sum of the candidate vote totals is slightly lower than the statewide candidate totals reported on the Secretary of State's website. This is due primarily to extensive changes in Wayne County precinct boundaries that we could not resolve. Jurisdiction-wide Absentee Vote Counting Board precincts are apportioned to geographic precincts by the proportion of the candidate vote within each precinct. For example, suppose a Republican candidate received 100 votes in two geographic precincts, 60 in precinct 1 and 40 in precinct 2. There is one at-large absentee precinct with 20 absentee votes, 10 for the Republican candidate. These absentee votes are then apportioned as follows: Precinct 1 receives 10*60/100 or 6 votes for a total of 66 votes for the Republican candidate and Precinct 2 receives 10*40/100 or 4 votes for a total of 44 vote for the Republican candidate. LCC-GIS makes no representation or warranties, express or implied, with respect to the reuse of data provided herewith, regardless of its format or the means of its transmission. There is no guarantee or representation to the user as to the accuracy, currency, suitability, or reliability of this data for any purpose. The user accepts the data 'as is', and assumes all risks associated with its use. By accepting this data, the user agrees not to transmit this data or provide access to it or any part of it to another party unless the user shall include with the data a copy of this disclaimer. The data are available on this website. Merged election and census data for census blocks, census voting tabulation districts (precincts and wards), and cities can be downloaded from the "Shapefiles - Statewide" file. Do not be distracted by the other data, which at first blush may appear to be the redistricting data you seek. The available election data includes every statewide, congressional, and state legislative election from 2002 to 2010. We have processed data provided by LCC_GIS so that selected variables conform to our database format. This block level database is in comma delimited format. It may be accessed here. New Jersey This block level database is in comma delimited format. It may be accessed here. The database includes total population and voting-age population by race and ethnicity variables, as described above. At this time, we do not provide any election data. New Mexico This block level database is in comma delimited format. It may be accessed here. Precinct level results are preliminary (pre-release) data obtained from Stephen Ansolabehere, Jonathan Rodden. New Mexico 2010 Census Shapefile and Precinct-Level Election Data. Release 2011. New York This block level database is in comma delimited format. It may be accessed here. Prison populations are obtained from Prisoners of the Census, which has analyzed the Census Bureau's Group Quarters data to identify prisons populations that qualify for reallocation for state legislative redistricting according to New York law. For the 79 census blocks identified with a qualifying prison population, we subtract these prison populations from the total population, or TOTPOP, to create a variable called TOTPOP_PRISON_ADJ. Note that New York law requires prisoners to be reallocated to their originating jurisdiction, while Prisoners of the Census data only enables subtracting these populations. When the NYS Legislative Task Force releases reallocated prison counts, we will update this database. 2010 election data are obtained from Stephen Ansolabehere, Jonathan Rodden. New York 2010 Census Shapefile and Precinct-Level Election Data. Release 2011. New York permits candidates to run under more than one party label. We use the raw party line vote data to aggregate the major party candidates' vote counts for every party line that they run under. 2006 and 2008 election data are compiled by the NYS Legislative Task Force on Demographic Research and Reapportionment, from the public records of local boards of elections, and provided by courtesy of the NYS Senate Minority Redistricting Office. Precinct level votes for each candidate are apportioned among census blocks according to the share of voting-age population of the block within each precinct. For example, suppose in Precinct 1 the Democratic candidate has 100 votes, the voting-age population is 100 persons, and there are two census blocks with voting-age populations of 60 in census block 1 and 40 in census block 2. Census block 1 would be apportioned 100*60/100 or 60 votes for the Democratic candidate and census block 2 would be apportioned 100*40/100 or 40 votes. Average of Democratic candidates' votes for 2010 Governor, 2010 Comptroller, 2010 Attorney General, 2010 US Senate two-year term, 2010 US Senate six-year term, and 2008 presidential vote. Average of Republican candidates' votes for 2010 Governor, 2010 Comptroller, 2010 Attorney General, 2010 US Senate two-year term, 2010 US Senate six-year term, and 2008 presidential vote. Ohio We are providing block level election data created by Mark Salling at Cleveland State University for the state of Ohio's redistricting efforts. We expect the full redistricting database will be posted at the Ohio Secretary of State's office soon. Oregon This block level database is in comma delimited format. It may be accessed here. Rhode Island This block level database is in comma delimited format. It may be accessed here. South Carolina This block level database is in comma delimited format. It may be accessed here. Election data were obtained from the Senate Judiciary Committee. These data provided by the Senate Judiciary Committee have 2008 and 2010 election returns associated with the 2010 census VTDs. do not include returns from county-wide absentee, emergency, failsafe, provisional, or failsafe/provisional precincts, which the South Carolina State Election Commission does make available in county level election return reports. We have apportioned these county-wide precincts to the geographical precincts within counties since approximately 1/3rd of South Carolina ballots are cast by absentee and our analysis determined that these votes are not cast for candidates at a proportional rate equal to the geographical precinct vote shares. Precinct level results are obtained from the Senate Judiciary Committee. County-wide absentee, emergency, failsafe, provisional, and failsafe/provisional precinct data are obtained from the South Carolina State Election Commission. These votes are apportioned to geographic precincts by the proportion of the candidate vote within each precinct. For example, suppose a Republican candidate received 100 votes in two geographic precincts, 60 in precinct 1 and 40 in precinct 2. There is one at-large absentee precinct with 20 absentee votes, 10 for the Republican candidate. These absentee votes are then apportioned as follows: Precinct 1 receives 10*60/100 or 6 votes for a total of 66 votes for the Republican candidate and Precinct 2 receives 10*40/100 or 4 votes for a total of 44 vote for the Republican candidate. Precinct level votes for each candidate are then apportioned among census blocks according to the share of voting-age population of the block within each 2008 and 2009 precinct. For example, suppose in Precinct 1 the Democratic candidate has 100 votes, the voting-age population is 100 persons, and there are two census blocks with voting-age populations of 60 in census block 1 and 40 in census block 2. Census block 1 would be apportioned 100*60/100 or 60 votes for the Democratic candidate and census block 2 would be apportioned 100*40/100 or 40 votes. This block level database is in comma delimited format. A revised version that fixes a Census Bureau error which allocated a naval base population to the wrong census block can be accessed here. The previous version without the correction can be accessed here. Precinct level results are obtained from the Virginia State Board of Elections. Note that the sum of the precinct level candidate vote totals is slightly different than the statewide candidate totals reported on the State Board of Elections website. Jurisdiction-wide absentee and provisional precincts are apportioned to geographic precincts by the proportion of the candidate vote within each precinct. For example, suppose a Republican candidate received 100 votes in two geographic precincts, 60 in precinct 1 and 40 in precinct 2. There is one at-large absentee precinct with 20 absentee votes, 10 for the Republican candidate. These absentee votes are then apportioned as follows: Precinct 1 receives 10*60/100 or 6 votes for a total of 66 votes for the Republican candidate and Precinct 2 receives 10*40/100 or 4 votes for a total of 44 vote for the Republican candidate. Create a correspondence between Virginia's 2010 VTDs and the 2008 and 2009 precincts using this look-up table. Precinct splits have been verified with local election administrators in counties and independent cities where there was not a one-to-one correspondence between the 2010 VTDs and the 2008 and 2009 precincts. Wisconsin This block level database is in comma delimited format. It may be accessed here. Ward level results are obtained from Wisconsin Legislative Redistricting. Only 2008 and 2006 election data are available at the time of the construction of this database. Ward level votes for each candidate are then apportioned among census blocks according to the share of voting-age population of the block within each ward. For example, suppose in Precinct 1 the Democratic candidate has 100 votes, the voting-age population is 100 persons, and there are two census blocks with voting-age populations of 60 in census block 1 and 40 in census block 2. Census block 1 would be apportioned 100*60/100 or 60 votes for the Democratic candidate and census block 2 would be apportioned 100*40/100 or 40 votes. Election data for the following statewide races are provided in the following fields. When unzipping the files in a Windows environment, be sure that your unzip program converts from Linux to DOS character returns (this is the default for most programs). When loading the geoheader file into the associated Access table, you need to use the supplied import specifications. When loading the Pl part 1 and part 2 files, read them in as a comma delimited file directly into the associated Access tables. There is no need to use additional import specifications.